This is probably only of interest to me, but while going through seemingly endless boxes of papers and manuscripts after my recent move, I came across a term paper I wrote almost thirty years ago for a class I took at the University of Manitoba. It was taught by my friend Howard Curle and in this instance allowed me to think about just what it was that irritated me about the work of Frank Capra. Looked at today, it serves as a reminder of how my thinking and writing about film has evolved over a period of decades. Naturally the context in which it was written (an academic approach to film) influenced the style, but what strikes me most is how these days I have no interest in this kind of close reading of a particular film. Writing here on my blog, I prefer to deal with impressions and emotional responses to what I see rather than more detailed structural and thematic analysis. So, for what it’s worth, here is a glimpse of one of the places I came from as a writer about film. Frank Capra’s Mr Deeds Goes To Town (1936) takes as its starting point two common motifs: the inheritance of an unexpected fortune and the clash between city and small town ways. Both of these forms generally pit a single, sympathetic individual against the inflated pretensions of a group or society into which he is abruptly thrust – and generally reveal what is genuine in the hero by exposing what is false in his opponents. But, while these forms supply the film’s structure and give it momentum, Mr Deeds’ subject is actually money – its purposes and its effects. Through characters drawn in terms of its standard motifs, the film builds a dialogue about the nature of money – essentially equating it with power – and asks: who should control it? To answer this question we must ultimately fall back on an analysis of the city/small town conflict and the values the film propounds through it. But first: what is the film’s view of money? Released in 1936, Mr Deeds Goes To Town is first of all a product of the Depression. There is an element of the fairy tale, of wish-fulfillment, in the sudden, unexpected inheritance of $20 million. But in a period of great poverty and unemployment, wealth virtually of necessity takes on a moral dimension – the fantasy must eventually come into contact with social reality or the Depression audience will likely be alienated. The form, then, seems to dictate that Mr Deeds will finally confront the larger implications of his wealth. We might compare this film with Walter Hill’s recent remake of Brewster’s Millions in which there is no such social context: here, Brewster is given an inflated $30 million to waste, but he lives in an affluent and wasteful society, so there is really no lesson for him to learn beyond the one of emotional honesty in a personal relationship. During the Depression, this kind of self-centredness would have been highly unsympathetic in a hero. Yet for the first two thirds of the film this is essentially how Longfellow Deeds (Gary Cooper) behaves. Having been whisked away from small town Mandrake Falls, he seems to spend his time jealously guarding his new-found wealth from all comers while going out on the town and having a good time for himself and pursuing personal satisfaction in his relationship with Mary/Babe (Jean Arthur). At several points he makes vague references to “wanting to do good” with his money, but he shows no particular inclination to come up with any ideas along those lines. It is only when he is forcibly confronted with social reality – in the form of a desperate, gun-wielding dispossessed farmer – that he finds a worthy mission. For Deeds, then, money seems to have no intrinsic meaning – it does not impress him as object – but is rather to be carefully controlled towards some particular useful end. The film presents this attitude as that of a shrewd small town businessman. Deeds’ cautious distrust of waste and dishonesty is set off against virtually every other character in the film. For the world of the city is absolutely motivated by money – money for its own sake, money as object. The scheming lawyers led by John Cedar (Douglas Dumbrille) wish to possess the fortune – not for any stated purpose, but simply because they are greedy. They are wealthy, dishonest (embezzling) businessmen who desire only to control more wealth. The opera board is carelessly profligate – what does it matter how much money they fritter away when they can always get more from some rich sucker? Deeds is beset by men whose obvious greed serves only to defeat their purposes because it runs headlong into his caution (he throws out “Mrs Semple”’s lawyer because he is suspiciously willing to make a deal for less money than the woman is entitled to). But all the other characters are money-motivated too. Cobb (Lionel Stander) will gladly hold off the press as long as he receives his stipend. MacWade (George Bancroft) will print anything if it will sell papers. Babe will infiltrate Deeds’ life on the most intimate level if it will get her a raise and a paid vacation. It seems then that Capra and writer Robert Riskin have determinedly set their small town lamb in the midst of a pack of ravening wolves. In fact, as Richard Corliss has commented, they appear to have “devoted so much energy to creating corrupt characters that they seemed to assume the audience would sympathize with Longfellow Deeds almost by default.” (Talking Pictures, Penguin: New York 1975, p. 222) The fact is, Deeds is essentially a passive, reactive character who at best merely resists the pressures exerted on him – that is, the extent of his actions in the first two-thirds of the film is to defend his money against “the vultures”. This problem reaches its peak when Deeds discovers that he has been betrayed by Babe – his response is to withdraw entirely, rejecting the money as the root of all his emotional woes. At this point Capra and Riskin introduce a deus ex machina in the form of the desperate farmer who abruptly introduces Deeds to a reality beyond the confines of his own personal life. Deeds suddenly has a mission. But when that is thwarted by Cedar’s attempt to declare him insane, Deeds again withdraws – this time into virtual catatonia. His position is virtually indistinguishable from sullen self-pity, the tactic of a child looking for sympathy (I examine this child-like element in the character below). He only emerges again (for a final triumphant exposure of the corruption around him) when Babe, Cobb, MacWade, and two thousand angry farmers demand that he return to them (fulfilling the injured child’s wish for love). Even here, then, his triumph is in a sense reactive. This practicality is linked in the film to pacing. Capra establishes two conflicting paces – a slow, considered one for the small town and its genuine values, and a rushing one for the city and its glittering phoniness. In the film, speed is used to confuse, to sweep you away, giving you no time to think (in fact, as the opening shots show, speed quite literally kills). In the lawyers’ offices, at the newspaper, in the opera boardroom and the restaurant, later in the courtroom itself – Capra gives us noisy, fast-talking groups who try to conceal their true thoughts and motives behind a constant babble. Opposing this is Mr Deeds’ slow talking, his sometimes painfully exposed feelings (“People here are funny: they work so hard at living, they forget to live…”; his sad question to Babe about why people have to hurt each other). Deeds is presented as completely honest – and in the film’s terms honesty is virtually a child-like characteristic, almost ploddingly literal (like the man at the Mandrake Falls station who confounds Cedar and Cobb with his completely literal responses to their questions). On the surface, Mr Deeds appears to be conventionally “dumb” to the city folks’ “smart”. But that “dumbness” is simply a lack of guile, a lack of sophisticated “adult” defenses. Underneath his surface, Deeds is really far more shrewd than his opponents – he carefully delays signing the power of attorney for Cedar; he throws out “Mrs Semple”’s lawyer; he stops the opera society board dead in their tracks; and he ultimately uses his slow, plodding logic to prove his own sanity. It is also this slowed down pace which gradually cracks the slick city veneer Babe has built around her small town past, enabling her to see through her own and others’ phoniness. But there is a negative side to the small town ideal set up by Capra and Riskin: because they associate verbal facility with city smartness, they have to find some other “weapon” for Deeds to use in his conflicts. All they can come up with is physical violence. Having told off the vulgar city poets and shamed them for their treatment of him (they ridiculed his practical poetry), Deeds is unsatisfied and must go on to slug them; it is not enough to have used his logic to expose “Mrs Semple”’s lawyer – he must physically throw him out; and finally, having dealt a resounding defeat to Cedar in court – using verbal logic – Deeds goes on to slug the lawyer to general approval. In each case, Deeds uses violence only after having already essentially defeated his opponent (when faced with a real problem – Babe’s betrayal, his arrest – he becomes completely passive); he comes across then as something of a bully (apparently he was in the habit of hitting people back home in Mandrake Falls, where there wasn’t even the excuse of squashing city slickers). 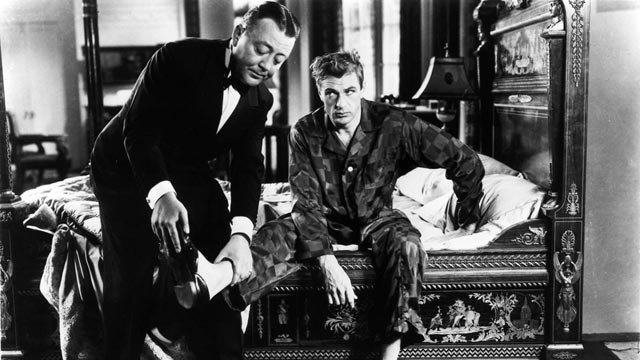 Even in visual terms, Deeds dominates the film physically: Gary Cooper stands far taller than any of the other actors. This is an important point because the final section of the film deals explicitly with the question of who should control the money. And since money in the film equals power, this becomes a political question. Which brings us back to the point – of central importance – that Mr Deeds Goes To Town was made in 1936, in the midst of Roosevelt’s attempt to establish the New Deal. This was essentially a plan to spread political power across a much broader spectrum of the population, giving a political voice to the poor and dispossessed of Depression America. These were the people who suffered most from the collapse of the American capitalist enterprise in 1929 – and these are the people who, in the film, take Deeds as their champion. What, then, is the film saying politically in its final third? Quite clearly the villains are the lawyers and businessmen who somehow have remained wealthy, and whose greed squanders the nation’s available resources, keeping the wealth tightly in their own hands to the exclusion of the needy. Deeds, on the other hand, is determined to help the needy with his wealth. This, Cedar declares angrily, will collapse “our entire system”. The country is, he says, economically incapacitated, and Deeds’ “childish ravings” will merely foment unrest. Obviously, he sees sharing the wealth as inimical to the capitalist ideal – his own well-being. Does the film then support some kind of socialist alternative, a redistribution of power? Even the mildly leftist New Deal? No, Capra and Riskin immediately have Cedar declaim that fixing the plight of the poor must be left up to the government. This proposition (“support” of the New Deal) is put in the mouth of a thoroughly discredited character and is thus discredited by association; further, the fact that the desperate poor seem to have no recourse but to flock to Deeds for assistance indicates that the government is failing completely in this task. The New Deal is discarded, leaving only one alternative solution: Deeds. There is to be no broadening of the political base. Although Deeds appears to be a democrat – he constantly objects to signs of subservience in his manservant – he nonetheless maintains his position of power in relation to the household staff; in the scene dealing with the echo in the hall, he seems to treat the staff as equals and partners – only to restore them firmly to their place by withdrawing abruptly from the game, leaving them to look slightly foolish, saying “let that be a lesson to you”. The film’s solution is to have the poor apply to the wealthy, well-intentioned philanthropist for relief. In implementing his plan to provide new farms for the farmers, Deeds retains full control of all the details (he even oversees the purchasing of the equipment and livestock); this is used to show his admirable dedication, but actually implies that the poor and dispossessed are not capable of taking on larger responsibilities. They are essentially children who must be guided by a paternalistic benefactor. The film ultimately calls for a virtually feudal solution to the nation’s economic problems, asserting the power of the individual above that of any political/economic structure. The conclusion of the film returns to the fairy tale unreality of the beginning: life would be wonderful if only the wealthy would do their duty. But in asserting this, the film raises one particular individual to a position of power while relegating so many others to a nameless position among the faceless crowd. In a typically American conclusion, Capra and Riskin offer up an untenably individualistic solution to a broad social problem. In Mr Deeds Goes To Town they call for a return to values which have never really existed and so finally disconnect themselves from the social situation they have ostensibly set out to resolve. This entry was posted in Commentary and tagged Actors, Classics, Directors, Film Criticism, Film History. Bookmark the permalink.